Ujjain, one of the larger cities in Madhya Pradesh, is well known as one of the holiest cities in India and an important Hindu pilgrimage centre for Shaivites, Vaishnavites and followers of Shakta. It is also famous for the Kumbh Mela that is organized here every 12 years. Located on the eastern banks of the Kshipra river, this historical city was a great political, commercial and cultural centre of Central India in the early 19th century. Today, it has been selected as one of the hundred Indian cities, to be developed as a Smart City, under Prime Minister Modi’s flagship Smart Cities Mission. The best time to visit the city is from September to March, when the weather is very cool and pleasant. By air – The nearest airport to Ujjain with regular flights to and from various other parts of the country, is the airport at Indore. By train – Ujjain has a good rail network with several other cities of the country. By bus – There are regular buses from many other cities to Ujjain. One of the most important Hindu temples dedicated to Lord Shiva, the Mahakaleshwar Temple near the Rudra Sagar Lake in Ujjain, is one of the twelve jyotirlingas situated across the country. The presiding deity in this temple is Shiva in the form of the lingam and is known as Dakshinamurti, which means that it is facing south. This temple has five levels and is adorned with idols of Omkareshwars Shiva, Parvati, Ganesh, Kartikeya and Nandi. Timings: 5 am to 7 pm daily. The Kal Bhairava temple is mostly worshipped by the Kapalika and Aghora sects. An age old tradition of offering liquor to Kal Bhairava is still maintained. Also thought to be associated with the cult of Tantra in Hinduism, one can spot many saadhus here with ash-smeared bodies and matted hair, who visit the temple to practice their Tantrik meditation. A Shivaling under a banyan tree, opposite Nandi-the bull, which was supposedly gifted by King Daksha to Shiva and Parvati, makes this a significant and holy shrine for the Hindus. The temple is thronged by devotees during Shivratri. Vedha Shala is the oldest observatory from the five built by Raja Jai Singh in the 17th century and is still actively used. According to Indian astronomers, the Tropic Of Cancer passes through Ujjain. This construction has served as a research centre since ancient times and one can find a planetarium with a telescope to observe the moon, stars, satellites and planets here. This lovely edifice of Persian architecture was built by the Mandu rulers in the year 1458 and is situated on an island in the Shipra river. Ravaged by time, this palace was once again restored by Maharaja Madhav Rao Scindia in the year 1920. Set against a lovely backdrop of the calm river, man-made tanks and channels, this palace makes a serene picture in natural surroundings. This red temple is an ancient Hindu structure built in the Maratha architectural style and is one of the Shakti Peethas. A special feature of this temple is the Sri Yantra or nine triangles that represent the nine names of Durga. Yantras represent the Cosmos and aids in meditation. The Harsiddhi Mata temple houses the idols of Goddess Annapurna in between Mahasaraswati and Goddess Laxmi. 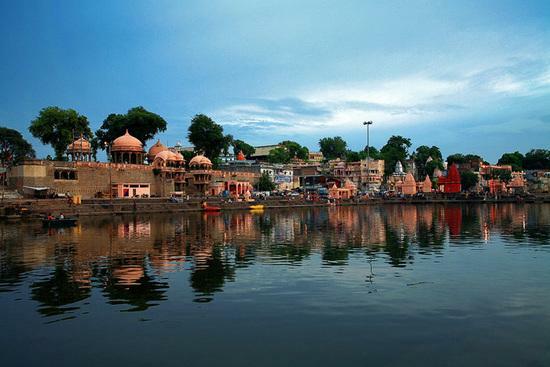 Ram Ghat is the most famous spot in Ujjain, near the Harsiddhi Temple, where the Kumbh Mela is held every 12 years. Devotees visit this place regularly to take a dip in the holy water and perform their daily rituals, with the hope of attaining salvation. Besides, this location is an ideal place for early morning and evening walks after sunset. Built in the 19th century, Gopal Mandir is dedicated to Lord Krishna and displays great Maratha architecture. This marble-spired structure contains a 2 feet tall statue of the idol which is to be venerated, and is elevated on a marble-inlaid altar with silver-plated doors. This temple is located in the middle of a busy market area and is well frequented by locals as well as tourists. This is an interesting attraction for those enchanted with history. These caves are situated on the banks of the Shipra river, very near the Gadkalika Temple. It is believed that Bhartrihari, a great poet and scholar and also the step-brother of Vikramaditya, lived and meditated in these caves, before he gave up worldly pleasures and pursuits. The caves are known to be quite deep and hence tourists must be careful with children and senior citizens while visiting. Timings: 5 am to 6 pm. Located on the banks of the River Shipra, on the Fatehabad Railway Line, the Chintaman Ganesh Temple is especially honoured as it is believed that the Ganesh idol revered here is supposed to have manifested/ been born of itself (Swayambhu). One of the oldest temples in Ujjain, this artistically done shrine is thronged with worshippers as the huge idol of Ganesh, called Chintaharan Ganesh, is also believed to relieve or free devotees from the troubles and anxieties of life. Gomti Kund is a steep water tank, located close to Sandipani Ashram and considered a holy place in Ujjain. It is believed that Lord Krishna directed the holy river waters from several pilgrimage centres to this water tank so that his aged Guru could peacefully perform all the rituals here. Gomti Kund is considered sacred by devotees who visit this place faithfully in the belief that they will be relieved and free from all life’s hurdles. It is also a perennial source of water for the ashram.